At last week’s council meeting Hart Council approved the draft Local Plan including a proposal to build Hartley Winchook new town from as early as 2024. 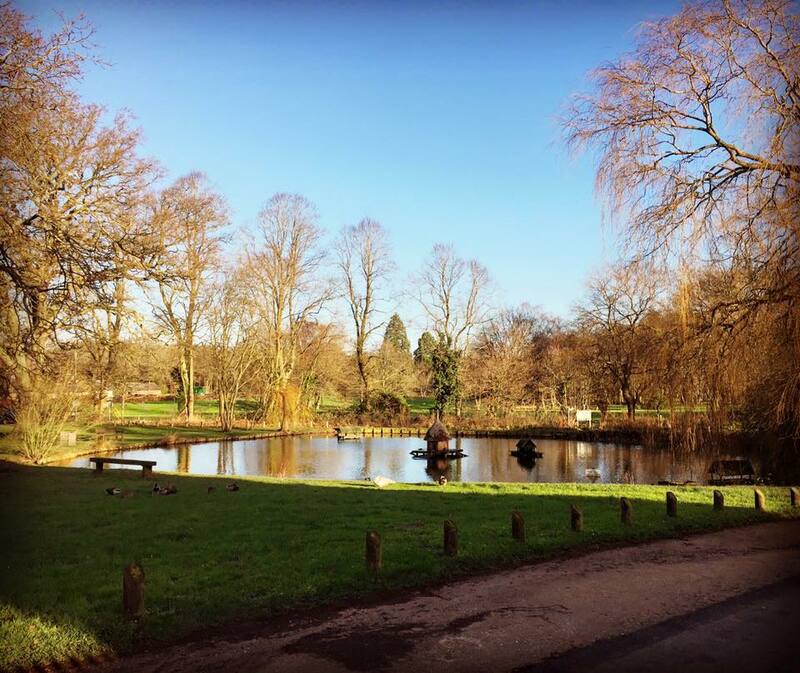 We are pleased that Hart has taken the next step in getting a Local Plan in place. However, we are angry and disappointed that the draft Local Plan includes proposals for an entirely unnecessary New Town in Winchfield and Murrell Green. We will of course, support the process to get the Local Plan adopted, but we will fight hard to get the New Town proposals removed from the Plan both in the forthcoming consultation and, if necessary, when the Plan is put before the Inspector. It was confirmed by councillor Cockarill at the council meeting that the Local Plan can proceed without the Hartley Winchook proposals. So, the new town is entirely unnecessary. We did prepare a statement for the council meeting that was partially read out by Councillor Burchfield. This is reproduced in full below. We are at an important point in the history of Hart District. We need to get a Local Plan in place urgently. We need to gain control over speculative planning applications. We need to regain control over developers who are running roughshod over the wishes of local people. However, you shouldn’t just approve any old Local Plan. The Government has done us a favour by changing the methodology to calculate housing need. The result is a position that We Heart Hart has been advocating for three years, namely a sensible housing target. The base requirement is 209 dwellings per annum. I can see the logic of planning to lift the ‘affordability cap’ resulting in 310dpa. I can even see a logic in adding a few more houses to cater for a realistic amount of unmet need in Surrey Heath. So, my favoured target would be 335dpa or 5,360 over the new plan period. But we would live with the proposed 388 target. I don’t believe anybody in the district would seriously challenge this outcome. However, for very dubious reasons, you have decided to plan for even more houses by promising to plan for an unnecessary new town. I and many others cannot live with this outcome, for a number of reasons. First, the proposed new town is not necessary. It will deliver houses we don’t need from as early as 2024, adding perhaps 100-200 houses per year, resulting in 800-1,600 extra houses. Second, this additional rate of building will end up being carried forward and compounded in future plans because of the way that the ONS household projections are calculated. Adding gratuitous extra houses now will add extra building pressure on our green fields for decades to come. Third, the proposed new town will end up starving our urban centres in Fleet, Hook and Yateley of much needed investment in regeneration. 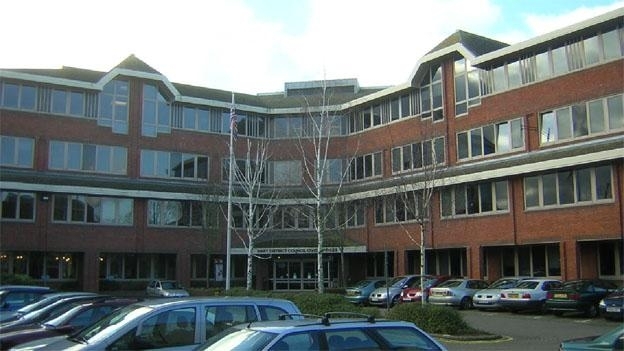 The residents of Hart have not been consulted on any regeneration plans. But a sensible regeneration policy could gather widespread support and deliver necessary affordable housing and infrastructure investment where it is most needed. Fourth, the proposed ‘area of search’ is inappropriate, as we know it includes areas that essentially failed testing in the recent sustainability appraisal, and some land that is definitely not for sale. Finally, the proposed draft Local Plan is very light on its plans for infrastructure. There are no objectives set for infrastructure, just a set of vague and woolly policies. There is no acknowledgement of the £72m infrastructure funding gap; there are no specific tangible projects and no costings. I fear this is contrary to current NPPF guidance and may render the plan unsound at inspection. So, I would urge you to modify this draft Local Plan to remove the unnecessary new town proposals. You should also provide greater focus on the plans and objectives for infrastructure: road improvements, healthcare facilities, cultural amenities and allowing appropriate room for expansion of our secondary schools should extra capacity be shown to be required. I believe these modifications would achieve near unanimous support across the district. 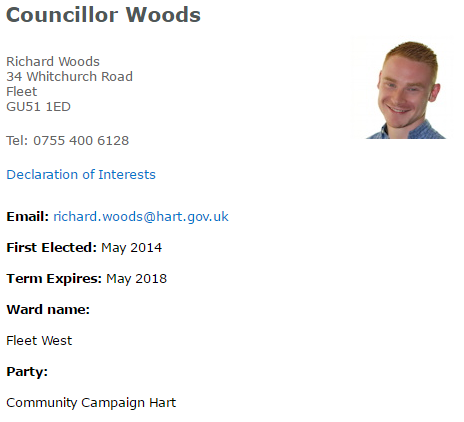 Hart Council has been thrown into some disarray after Conservative Councillors Sara Kinnell and Richard Woods have defected to Concrete Community Campaign Hart (CCH). These changes to the balance of power on the Council have not been formally announced by either the council or the parties. 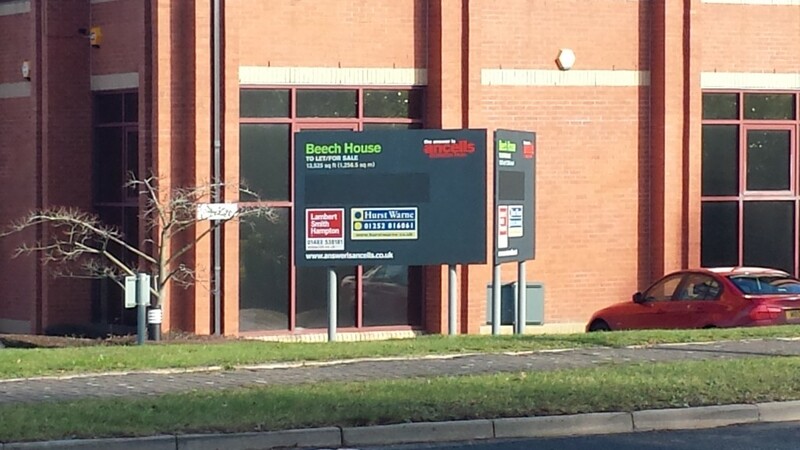 However, they are clearly shown on the council website. 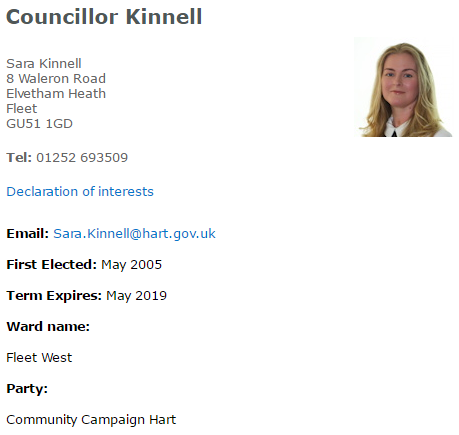 On Tuesday 29 November we received confirmation that Cllr Sara Kinnell and Cllr Richard Woods had changed political party both from Conservative to Community Campaign Hart (CCH). There have been no changes in the Leadership of the Council or the Cabinet Members and the allocation of major committees remain unchanged. It is not clear why CCH have not announced this coup on their own website. It is also not clear why these councillors have not done the honourable thing and resigned their seats and fought by-elections to reaffirm the support of their constituents. Prior to the defections, the Tories held 16 of the 33 seats and relied upon independent councillor Rob Leeson for a majority. Now they only hold 14 seats which makes them the largest party but still two short of an absolute majority even if they can continue to rely upon the support of Councillor Leeson. It is unclear why the councillors have made this move. However, at the council meeting of 27 October both councillors voted for the CCH amendment to mandate a new settlement in Hart even though the other Tories (and some Liberal Democrats) voted down that amendment. Their move is strange for a number of reasons. First, even though the CCH amendment failed, the current position does not preclude a new settlement. 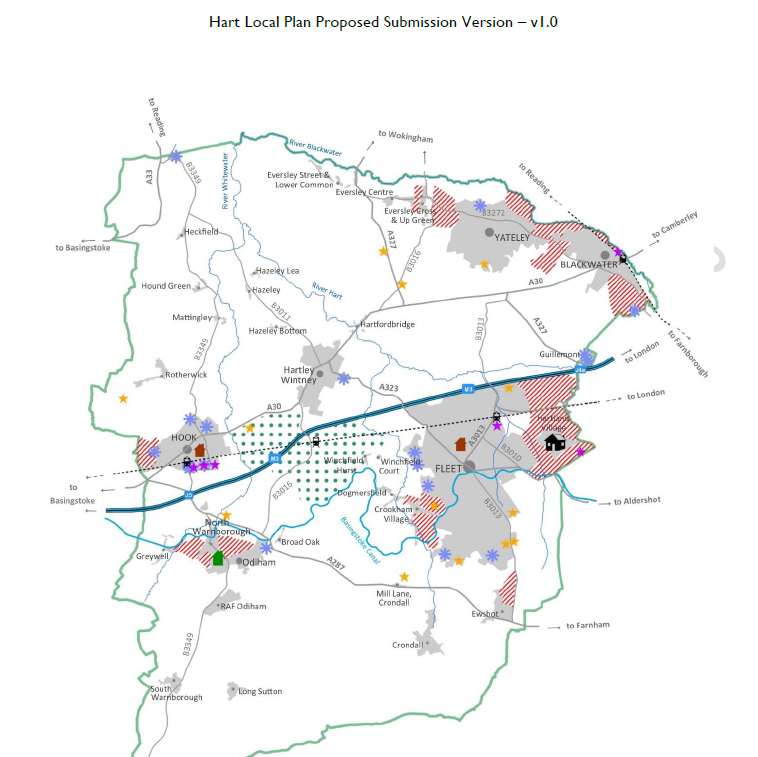 Secondly, We Heart Hart understands that the proposed Winchfield New Town has failed testing, so regardless of the opinions of Councillors Kinnell and Woods, this new town won’t go ahead because it is not viable. It is not clear what the impact of this move will be on the composition of the Planning Committee. 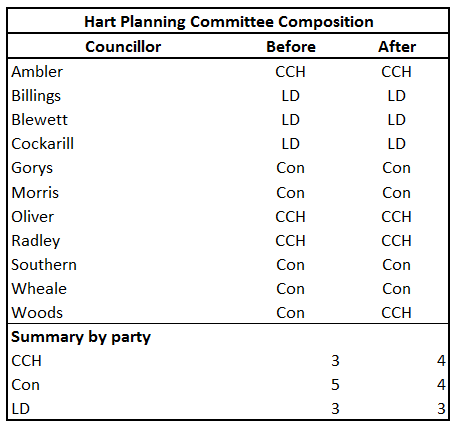 We Heart Hart understands that the composition of this committee should be proportional to the number of seats each party holds on the council. Councillor Woods sat on the committee as a Conservative, but is now CCH. So, the Tories lose one and CCH gain one seat on the committee, giving each party the same number of seats on the committee, even though CCH have four fewer seats on the council. It would be ironic indeed if Councillor Woods was ejected from the Committee to be replaced by a councillor opposed to the Hartley Winchook New Town. Indeed it would be even more ironic if he was unable to vote on the upcoming planning application about Grove Farm (Netherhouse Copse). It is clear there is huge amount of wrangling going on over the spatial strategy that is due to be unveiled on 13 December. It seems the Tories will be reliant upon some of the Liberal Democrats to carry through their preferred proposals. Hook Action Against Over Development have been in touch with some of the local candidates for Hook ward in the Hart District Council local elections 2016, and managed to get some additional information out of their local candidates and have circulated this in an email to their supporters. 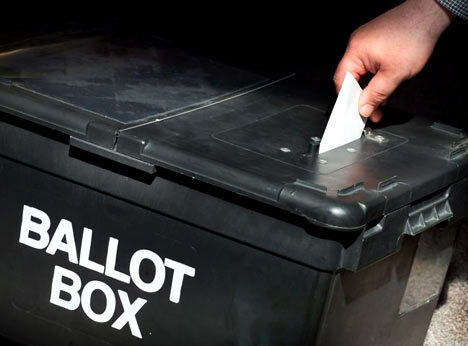 Colin Ive, Liberal Democrat – No election leaflet delivered, local party website has no information on the current elections and no candidate contact details. Local councillors have surprisingly limited powers, but they can be held to account, so they represent YOUR views. 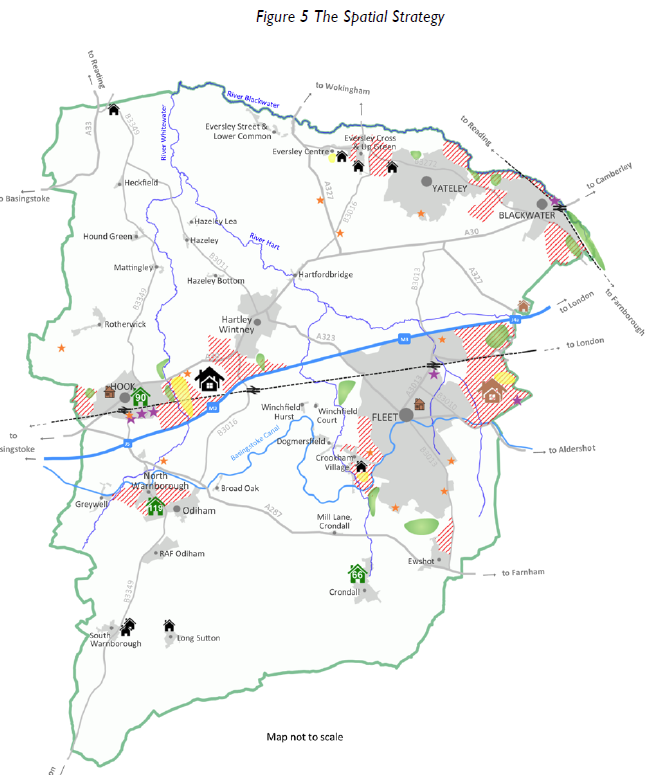 In particular over the proposed Winchfield development. A new development will prevent the irresponsible expansion of existing towns and will come with essential infrastructure improvements. We need to act now, before a solution is imposed upon us! On housing, a UKIP representative would weigh up the merits of any particular project and would decide accordingly. We all understand the results of over-development – schools, doctor’s surgeries, roads etc. simply cannot cope with the additional strain being placed upon them but nothing ever seems to get done to curb the problem. A UKIP councillor would introduce a measure of realism into the debate and could be relied upon to listen to residents and take account of any grievances they may have. We recognise that new dwellings do have to be built to cope with the increase in our population – caused largely by a laissez-faire attitude to immigration by subsequent governments – but accommodating additional persons must be done sensibly and UKIP councillors would concentrate on brown field sites as a priority. A UKIP councillor would support improved infrastructure measures and would seek to ensure that there are better schooling and medical facilities, more parking places especially where doing so helps local businesses, and an improved transport network. The Planning Inspectorate has decided not to allow a solar farm to be built at Trimmers Farm, near Beggars Corner, on a site that straddles Hook and Winchfield parishes. The implication of this decision is that it also likely scuppers the proposed Hartley Winchook new town. The full decision can be downloaded from the button below. 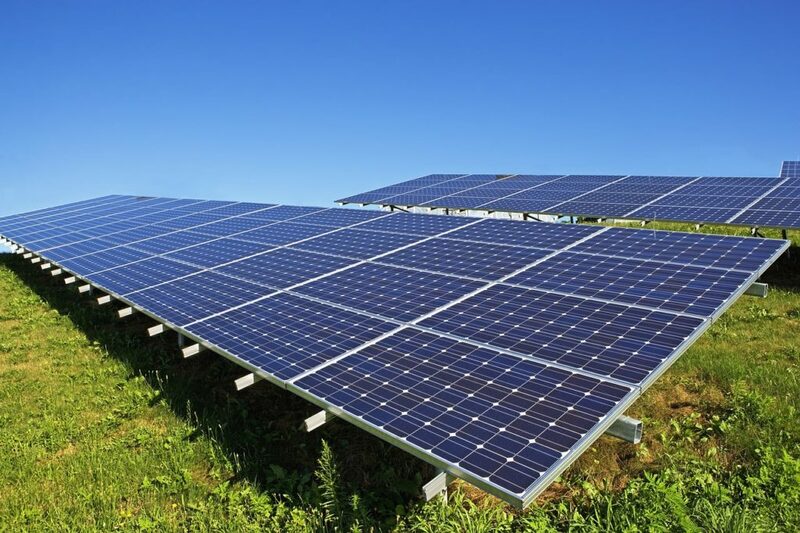 From my own observations and having regard to the appellants’ photomontages and Zone of Theoretical Visibility (ZTV), the solar farm would have an adverse visual impact which would significantly detract from the visual amenity of the area. Having taken into account the presence of the railway, motorway and pylons I consider that the proposal would consolidate the spread of man-made features across the skyline and add to the creeping urbanising effect on the area, thereby exacerbating the resultant harm to the landscape character and visual amenity. 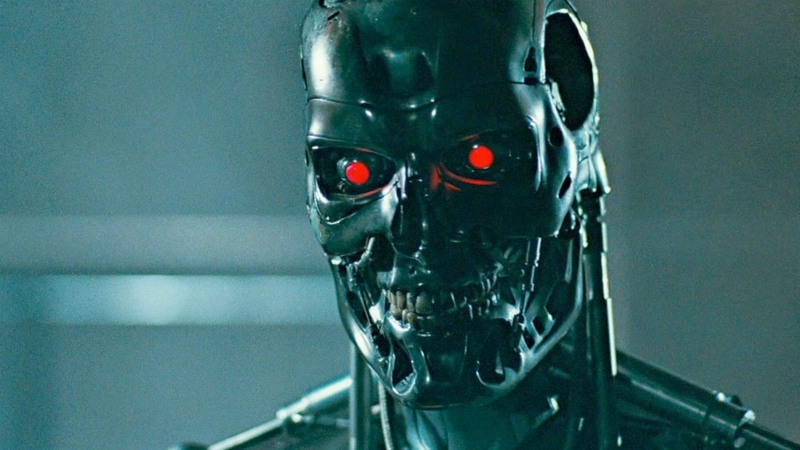 In conclusion the level of harm to the character and appearance of the landscape would be significant and would conflict with LP saved Policies GEN10, GEN1, GEN3, CON23, RUR2 and RUR3. 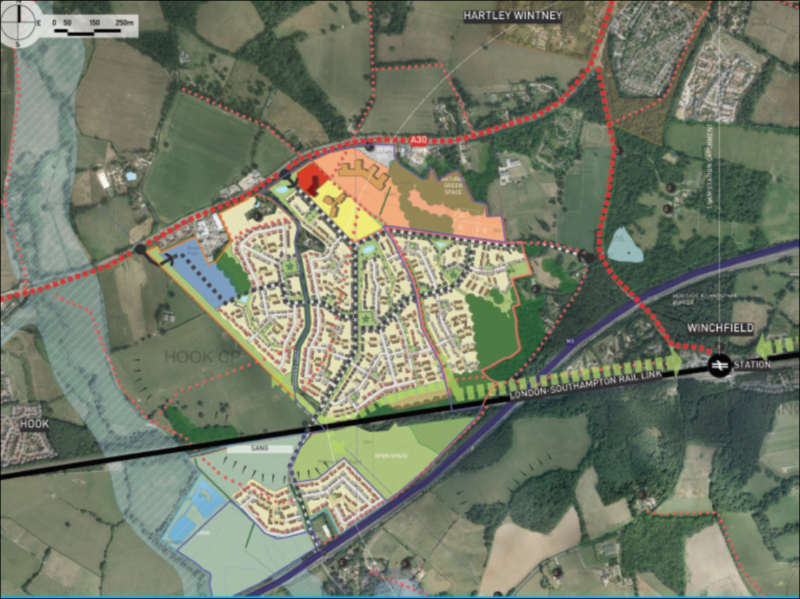 The implications of this could be quite interesting as the same Beggars Corner site is contained in the Strategic Housing Land Availability Assessment as SHL 167, and is included in the proposals for the proposed new town at Winchfield. 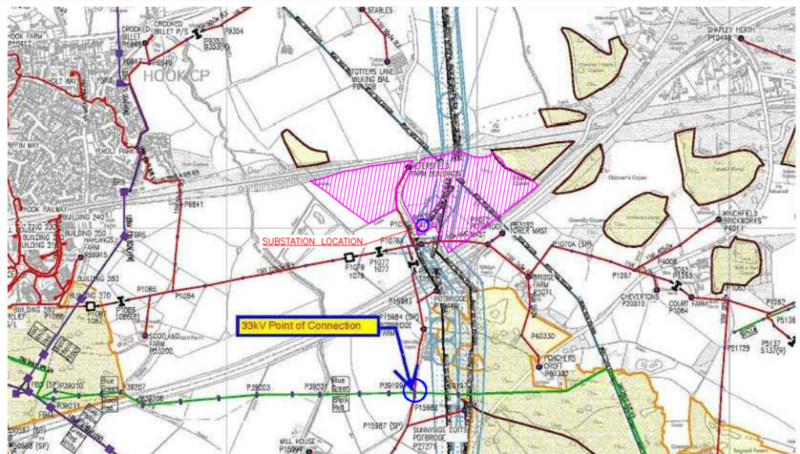 We have written before that 772 houses were proposed to be built on the former land fill site. However, we find it difficult to believe that 772 houses, many of which might have solar panels on their roofs, would have a lower visual impact or create less creeping urbanisation than a solar farm. Of course, the challenges of building houses on landfill would be much greater than installing solar panels. 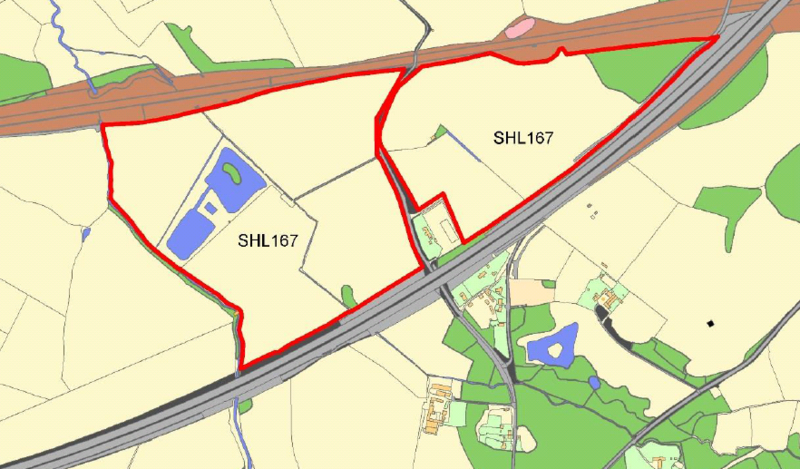 As can be seen from the image below, the removal of SHL167 from the new town plan would effectively isolate two halves of the proposed new town, with the Murrell Green sites being disconnected from the other sites. This will compromise sustainability and will also reduce the housing capacity. 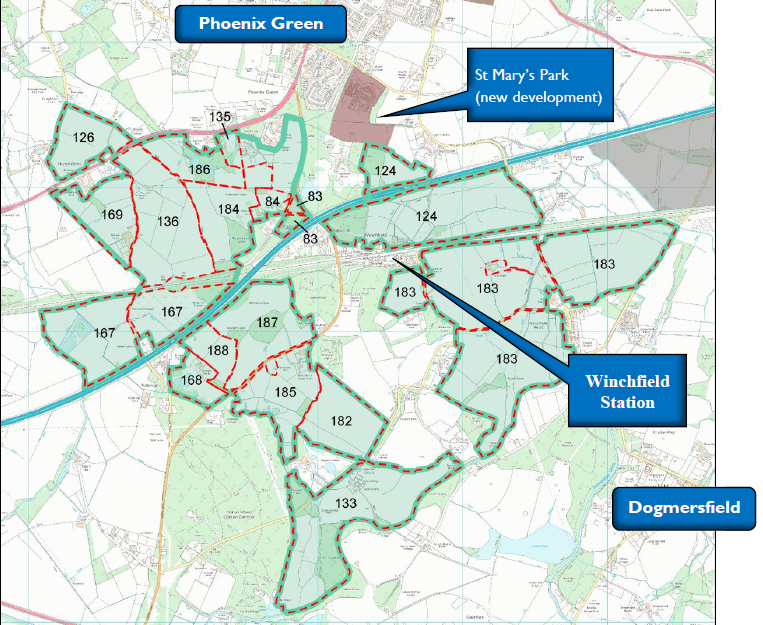 We have previously challenged the viability of the new town plan, as have Winchfield Parish Council. 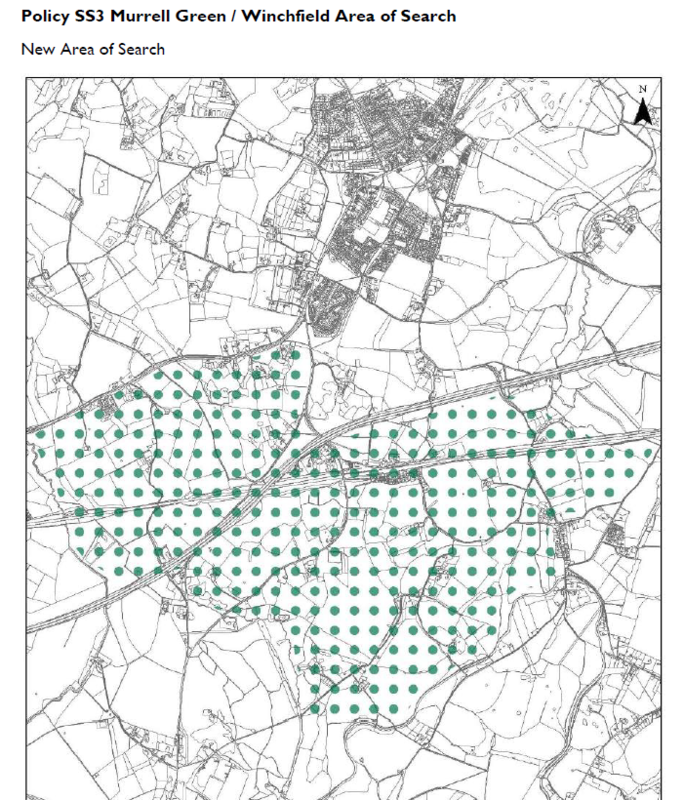 However, to re-cap, the SHLAA suggests that the housing capacity of the new town sites is in the range 6,500-7,500. But not enough space has been set aside for SANG, or for sports facilities, schools, shops, car-parks or community facilities. Making allowance for these elements would reduce capacity to 4,000-5,000. Removing the 772 houses from SHL167 would further reduce the capacity to 3,228-4,228, which is well below the minimum viability threshold of 5,000 dwellings.